The stock of smuggled liquor that police seized. 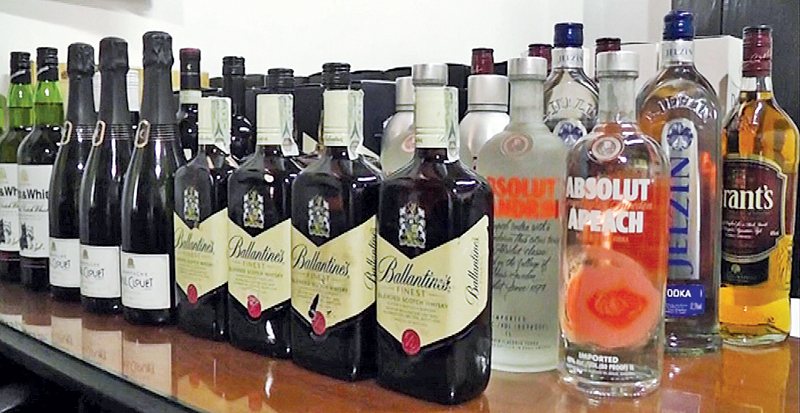 A leading Kandy businessman allegedly selling foreign liquor smuggled into the country was arrested by officers of the Central Province Fraud Bureau yesterday. The stock of foreign liquor valued at nearly Rs. 400,000 was also seized. The suspect was allegedly selling the smuggled liquor under the guise of running a wholesale and retail shop in Kandy town. The arrest follows a tip-off received by OIC Frauds Unit Inspector Thusitha Dombagammana. A spokesman for the unit said the haul included 58 bottles of whiskey of different brands, which he was selling at prices ranging from Rs. 10,000 to Rs. 15,000. The raid was conducted using a police decoy who bought a bottle of liquor for Rs. 5,000. The shop had been raided by Excise and police officials on several occasions in the past too, over the same racket.